Bodriggy’s Space Milk series is now a trilogy with the release of a lactose sour that might feature the Abbotsford brewery's most unusual collection of ingredients yet. 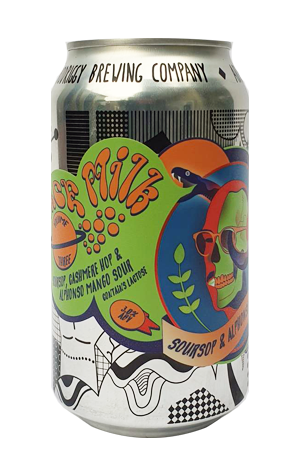 Following on from the lactose-sour-pineapple-lime-cayenne pepper offering, Bodriggy has returned with a Cashmere-hopped soursop, alphonso mango sour. Popular in Central and South America, soursop is a sweet fruit often used in juices and is variously described as being akin to sweet pineapple, strawberry, citrus and smooth banana. Comparatively, the alphonso mango seems a little boring, even if it’s occasionally tagged the king of mangoes. It’s those alphonso flavours that are most readily apparent as soon as you pour the beer, which manages to both look and smell like mango juice. While that flavour might the dominant one, there’s more underneath too: pineapple and banana and, though it’s a lactose-laced beer, it’s also quite dry. The Cashmere hop, a child of American stalwart Cascade, also adds a whiff of floral lemon to the mix.